Public service is one of the core principles upon which UC was founded. UC students take this commitment to heart. UC produces more Peace Corps volunteers than any other university in the nation. UC produces more Teach for America volunteers than any other university in the nation. Almost half of UC undergraduates report participating in community service, according to UC’s biannual student experience survey. UC campuses dominated Washington Monthly’s list of colleges that provide the greatest public benefit, in part due to their culture of community service. 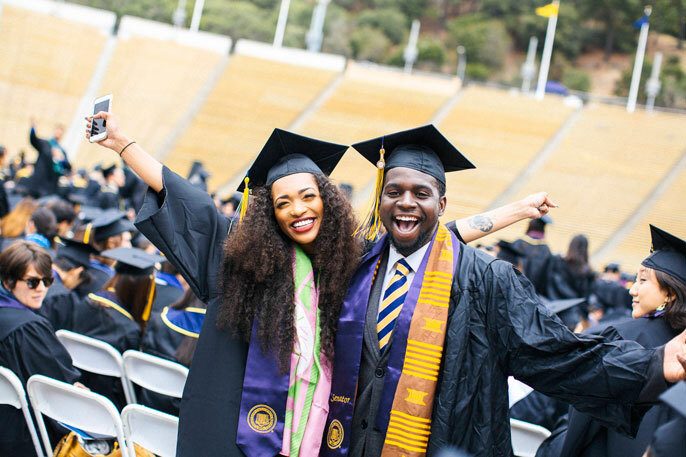 For every student who dons a cap and gown this weekend, graduation day is a celebration of a hard-won accomplishment. But for many thousands of new graduates, commencement also marks the start of a life devoted to making a positive difference for others. As the Class of 2016 takes the stage this weekend, it’s not only those tossing mortar boards, hugging and snapping photos who have reason to cheer. It is also the countless others who have been, and will be, profoundly influenced by their contributions. In fact, many of UC’s new grads are already deeply engaged in public service: helping returning combat veterans, providing food and housing to the homeless, bringing hope to communities in need. Here are a few members of UC’s Class of 2016 who are paying it forward – working to expand opportunity for others before the ink on their own diplomas is dry. Returning Marine Brian Vargas was almost killed nine years ago in battle in Iraq. Now, the newly minted UC Berkeley grad helps returning warriors cope with PTSD, and is working to develop new approaches to suicide prevention among veterans. Vargas himself still struggles with health problems from his injuries, but they have not deterred the 29-year-old social welfare major from being a tireless advocate for fellow veterans, both at Cal and Diablo Valley College, where he helped establish a student veterans center. Out of a sense of mission to a close friend who took his own life, Vargas is now working with a U.S. Veterans Administration psychologist to design a novel method of deterring veterans from impulsive firearms suicide. As the first African American female to be student body president at UC Davis, Mariah Watson has been a tireless advocate for students from all walks of life. She has led efforts to expand the food pantry, developed systemic solutions for students who cannot afford housing, and worked with campus officials and the UC Office of the President on issues facing underrepresented minority students. “I realized that by advocating for historically marginalized and underrepresented populations, I was advocating and trying to improve the campus experience for everyone,” she said. Her experience at UC Davis, she said, has given her the skills and confidence to grow into the person she has always wanted to be – and to carry her passion for politics and public service into her future. Biological sciences major Mary Sargious has a strong advocate in her mother. She pushed Sargious to strive for college and also set the standard for helping others. From a young age, Sargious appreciated that not everyone had those kinds of role models. As a teen, she worked with her mother to help members of their church community, an activity that led to involvement with foster youth. At UC Irvine, Sargious founded a project to help foster teens and first-generation students get to college. The program pairs 30 mostly B and C students – many of whom don’t see themselves as college material – with UC Irvine undergraduates, who mentor them one-on-one, take them on campus visits, and encourage them to strive for more. For Kevin Hale, helping others is what saved him. This weekend, the 53-year-old father of four and grandfather of three will receive a degree in sociology from UCLA, where he is an accomplished mentor and student leader who has worked to promote health, cultural pride and educational opportunities for Native Americans. He is also a counselor with a local alcohol treatment center. Just a few years ago, Hale was sleeping behind a hardware store, an alcoholic with little hope for the future. After his brother enrolled him in treatment, Hale discovered he was a supportive listener and counselor with a knack for supporting those with struggles similar to his own. The desire to extend a helping hand has fueled his will to turn his own life around. Six years ago, Stephen Maxey was living on the streets. Now, with a shiny new psychology degree in hand, he has landed a job managing a project to turn an old downtown hotel into a service center for the city’s homeless. He credits many people with helping him get to this point, from his advisor and professors at Merced College to the other homeless people at the rescue mission who helped him study and got him back on track when he wanted to give up. Having helped to build a bridge between UC Merced and the homeless community, Maxey now looks forward to working with local officials to help others find a permanent place to live. "There’s no way I could pay everything back,” he said. “But when you can go and make something happen that helps someone, it feels good – and it’s not that hard. We don’t have to move mountains to make a difference." As UC Riverside students Hanni Schoniger and Jade Zamorano prepare to receive their Bachelor of Science degrees, they want to make sure there are plenty of other young women who will follow in their footsteps – especially those from communities in the Inland Empire, where jobs and opportunity are sometimes in short supply. As biology majors with minors in neuroscience (Schoniger also has a minor in education), the women started an organization called Change in Scientific Importance for Youth – otherwise known as Delta SIFY – to motivate middle and high school students to go to college and pursue careers in science, technology, engineering, and math (STEM). The organization works in two Riverside-area schools to provide underserved kids with hands-on science workshops and college and career mentoring. While completing his own studies, Vincent Pham spent hours in schools across San Diego helping students in underserved schools to improve their grades and achieve their college ambitions. Pham has also served as a mentor on campus, advising first-year students on the wealth of academic resources available to them. As editor-in-chief of the student newspaper, the UCSD Guardian, he has helped cover campus issues large and small. After graduation, Pham will take his teaching work all the way to Dong Ha, Vietnam, where he plans to do a year of service through a Fulbright English teaching award. Then he plans to return to serve as a teacher in low-income communities. “It is my firm belief that life in service is a life well-lived,” Pham said. Just a few years ago, Anthony Nardone sold all of his belongings and took off travelling, drawn to see remote parts of the world. That experience is even more meaningful today, as Nardone looks to use the master’s degree in global health that he will earn this summer to make an important difference in the lives of the people he encountered. Nardone was doing volunteer and research work in Central and South America when he came across an odd fact: men were dying from kidney failure in disproportionally large numbers. He is working on a program to develop and distribute portable packs of drinking water, a simple solution that could reduce mortality and long-term health problems by enabling agricultural workers to stay hydrated in the field. “What’s special about this is that it’s so simple,” he said. It took more than just personal courage for Alagie Jammeh to speak out for the rights of LGBTQ people. In his native country of Gambia, homosexuality carries a penalty of lifetime imprisonment. When the Gambian government discovered that he had made online statements advocating an end to global persecution based on sexual orientation, Jammeh lost his UC Santa Barbara scholarship, was cut off from his family and risked being thrown in prison should he return home. Without money or secure housing, Jammeh nevertheless kept to his studies and continued to advocate for LGBTQ and other human rights. He has since been granted asylum as a political refuge, and was recently recognized by the Human Rights Commission for his work on fighting for LGBTQ people around the world. Ciera-Javae Gordon credits poetry with saving her from depression and enabling her to transcend the cycle of poverty and violence in the community where she grew up. As a UC Santa Cruz undergraduate, she worked to bring that power to others, and created a poetry and writing workshop for men who are incarcerated. The project, which will be continued by other students after she graduates, has helped men behind bars have something positive to share with friends and family, and offers outsiders a window into the lives of those who are incarcerated. Diverse undergraduates discover pathway to Ph.D.